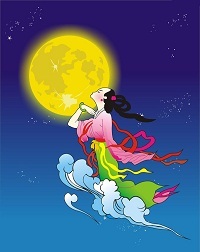 Long long time ago, there was a beautiful young girl named Chang E(嫦娥) working in the Jade Emperor's palace in heaven, where immortals, good people and fairies lived. One day, she accidentally broke a precious porcelain jar. Angered, the Jade Emperor banished her to live on earth, where ordinary people lived. She could return to the Heaven, if she contributed a valuable service on earth. So Chang E was transformed into a daughter of a rich farming family. 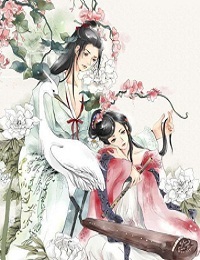 When she was 18, a young hunter named Hou Yi（后羿） from another village spotted her, now a beautiful young woman. They became friends. One day, a strange phenomenon occurred—10 suns arose in the sky instead of one, blazing the earth. Hou Yi, an expert archer, stepped forward to try to save the earth. He successfully shot down nine of the suns, becoming an instant hero. He eventually became king and married Chang E.
But Hou Yi grew to become greedy and selfish. He sought immortality by ordering an elixir be created to prolong his life. The elixir in the form of a single pill was almost ready when Chang E came upon it. She either accidentally or purposely swallowed the pill. This angered King Hou Yi, who went after his wife. Trying to flee, she jumped out the window of a chamber at the top of palace—and, instead of falling, she floated into the sky toward the moon. King Hou Yi tried unsuccessfully to shoot her down with arrows. In contrast to the first version, her companion, a rabbit, does not create elixir of life. Aside from the rabbit, the moon is also inhabited by a woodcutter who tries to cut down the cassia tree, giver of life. But as fast as he cuts into the tree, it heals itself, and he never makes any progress. The Chinese use this image of the cassia tree to explain mortal life on earth—the limbs are constantly being cut away by death, but new buds continually appear.